(d) the time by which the said construction is likely to be completed? (a) One Jawahar Navodaya Vidyalaya (JNV) caters to the needs of a total number of 560 students, both boys & girls. Accordingly, dormitories for 384 boys and 192 girls are built during the establishment of the Vidyalaya. However, due to increase in the number of girl students in the JNVs, few additional dormitories have also been constructed for the girls, as per requirement. Additional dormitories have also been constructed for converting two tier dormitories into single tier ones. 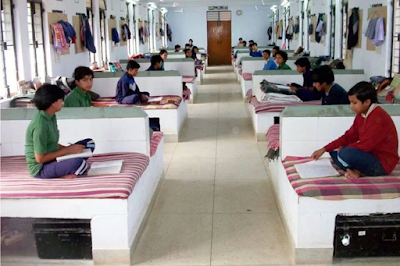 Navodaya Vidyalaya Samiti (NVS) has taken up construction work of additional dormitories in 123 JNVs in various parts of the country since 2016-17 which will cater to the needs of 8815 boys and 6807 girls. In Maharashtra alone, construction work of additional dormitories for 96 boys & 48 girls has been taken up since 2016-17. Details of these cases including Maharashtra are annexed. (b) & (c) The work of construction of dormitories for 96 boys and 48 girls at JNV Shegaon, Buldhana, Maharashtra was allocated to Central Public Works Department (CPWD) on 1.3.2011. The construction agency started work in January, 2012 and around 51% work has been completed. However, following dissolution of the firm to whom the work was awarded by CPWD, the contract was rescinded by CPWD on 2.6.2018. (d) No specific time frame can be indicated as the work can re-commence only after re-invitation of bids and award of work by CPWD. ANNEXURE REFERRED TO IN REPLY TO PART (a) OF LOK SABHA STARRED QUESTION NO. 9 FOR 4.2.2019 ASKED BY SHRI PRATAPRAO JADHAV, MEMBER OF PARLIAMENT REGARDING HOSTELS IN NAVODAYA VIDYALAYAS.